All packs below can be found HERE for your convenience, or if you just prefer mega over mediafire. This alters the items mostly associated with the quest world. No blocks are altered. No sounds are added. 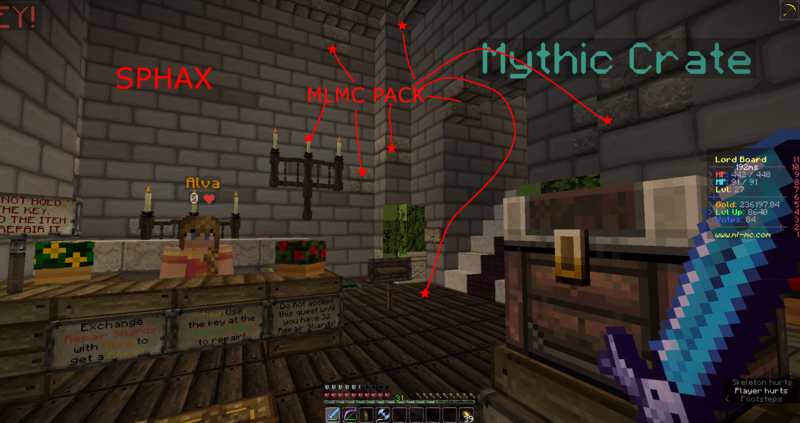 Since Mizark is no longer working on the pack, I have taken the files and done what I can to finish the pack. Optifine is highly recommended. Custom item textures can not be seen without them, though not having optifine will not stop the pack from working. Note: You need the main pack active in order to run the models pack. If the pack doesn't show up when put in the resource packs folder, unzipping the file should fix it. January 23, 2018 - Fixed all messed up/missing textures reported. Fixed: Jungle leaves, waterlilies, grass blocks, and corner rails. Missing: Some Music files, Parrots, Magma Blocks, etc. March 28, 2018 - Custom Ingredient textures added. Custom Head Staff Mask textures added. Custom Elytra textures added. Splash text added. Icon changed to match server icon. Most sounds have been changed. New Lite version for those who don't want the new sounds, or want a smaller download. Some paintings were replaced by screenshots by members of the server. April 26, 2018 - All custom item textures separated from the main pack to be added elsewhere, Lite version appears brighter, lily pads fixed for good now (work in cold biomes finally). May 7, 2018 - Custom item textures re-added in the main packs while another project is worked on. Ed, if they look like there's a bunch of excess green around their fluff, you need to make sure trees are not set to fast in optifine (smart and fancy work, haven't seen default) or if you aren't using optifine, set your graphics settings are on fancy. I'm running it on Optifine, and that seemed to fix it. Thank you; It's perfect! The cause of it is the way mc adds the leaf color where the texture's supposed to be transparent if the graphics are set to fast. Frees up having to load every leaf block's sides separately. As far as I can think of, only leaves do this, and since you're around them so much you either really notice it, like with the models pack, or don't at all without. is there another resource pack we can use?? There's been an update to the resource pack~ Be sure to check it out and let me know if anything is broken!